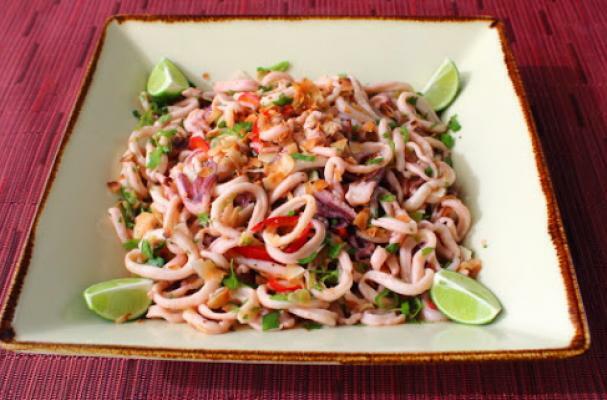 Spicy coconut and squid salad is summertime in a bowl. This simple Thai inspired salad will knock your socks off. Squid can be intimidating to prepare but I assure you that it's easier then you think. For this recipe, the body and tentacles of the squid are used. You can usually purchase the squid already cleaned at your local fish market. You can use both fresh or frozen for this recipe. When slicing the tube into rings make sure that they are all the same thickness so that they cook evenly. Prior to cooking, the squid is marinated in a mixture of lime juice, palm sugar coconut milk and chilies. The key to tender is cooking it for a minute or less. Overcooked squid because tough and chewy. Let the squid come to room temperature again after cooking before you chill it in the fridge. Serve this squid salad on a bed of butter lettuce with vermicelli noodles.